What is the ministry of being an usher? Ushers generally arrive before most of the congregation does. 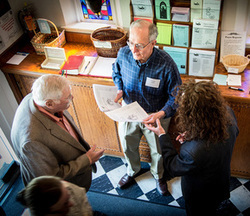 The first person who greets people when they arrive for church is an usher who welcomes them and hands them the weekly bulletins. During the rest of the service we kind of fade into the background until at various times we help with the service. We count every person in the congregation and those numbers are used in our annual report to the diocese. We pass the plates at the offertory, close and open the altar rail at the appropriate times, and direct the congregation to the altar for Holy Communion. Following the service we make sure that the pews will be ready for the next service. We place the prayer books and hymnals where they belong, straighten up the kneelers, and remove any bulletins that have been left behind. If you are interested in this ministry, please contact Bruce Lawrence.